Do you send out a press release when you get new best friends? Just checking. Overly ornate pedicures. They’re feet ladies, not Christmas trees, relax. The Chocolate Hip Pack isn't just for skateboard enthusiasts! Are you nuts? Total motocross guys love them. Even when it means you have to put 78 things on instead of 77 just to go motorcycle riding. 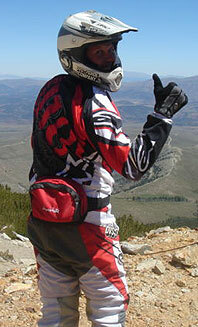 BD modeling what I can only imagine Carey Hart is going to be ordering, The Chocolate Hip Pack.